The above code looks legit to us (but it might not be); we are waiting to hear back from the Reddit user who posted it to ask how she got it, but here’s our theory: Yik Yak is now in private beta for a desktop version of the app. Until now it has been available on phones only. It may be that the code above was obtained for someone who has access to the beta version of the web client. 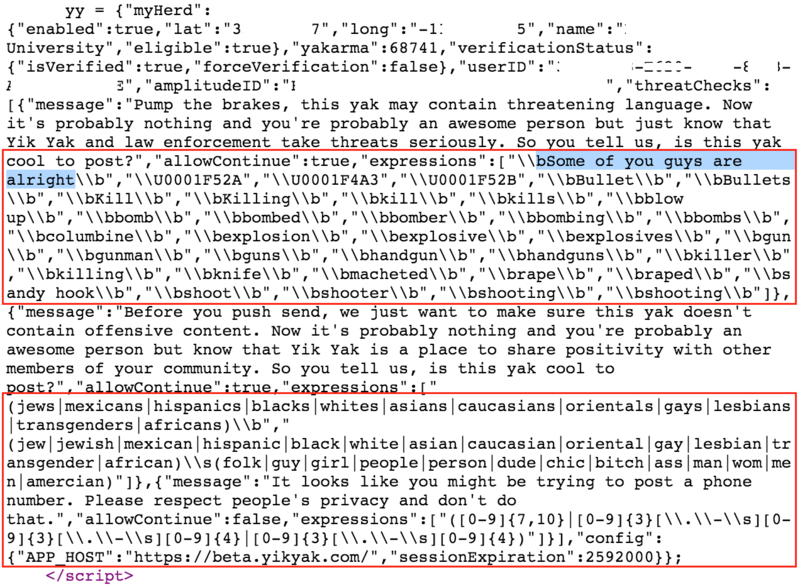 The above code shows a list, perhaps incomplete, of the phrases that Yik Yak thinks might be included in a threat or harassing post, and the warnings that users receive if they try to post such a message. Note that users are not allowed to post phone numbers at all. We ran a test to see whether Yik Yak’s warnings actually work as described in the code above. We changed the location of one of our phones to be at a college (though it doesn’t look like that makes a difference), and posted 2 messages that contained elements that are in the restricted list above. In the first case, we could have posted the message after being shown the warning. We don’t know whether posting a message that was pre-flagged results in any further scrutiny. In the case of posting a phone number, that is prohibited and users cannot proceed past the warning screen. We applaud Yik Yak for attempting to get out in front of messages that may be inappropriate, but assume that the folks there, and the community, don’t necessarily want the specifics in the public domain. If you are a Yik Yak user and inclined to post a threatening message, or someone’s phone number, the above code gives you some information about how to get around the Yik Yak safeguards. We’ll update this post with more info as it becomes available.